and amount of substance N.
Hence by the principle of homogeneity, the given equation is dimensionally correct. Check the correctness of physical equation. Nb: E has the units of pascals per second. Where A is a dimensionless constant and g is the acceleration due to gravity. Equation (i) is homogeneous and can be used. Equation (ii) is homogeneous and can be used. Which is different from the unit of ‘T’, so it cannot be used. From the graphs above, the graph of 𝑇 against 𝑙 is a straight line passing through the origin. Therefore, the equation 𝑇 = 𝐴𝑙√𝐸 is correct. Nb: the unit of ′ 𝜂′ is the pascal per second. the dimension of a,b,c? Also write the quantities they represent. their dimensions are the same. Dimensions of 'a' are that of displacement. Hence 'a' represent the displacement. Dimensions of 'a' are that of velocity. Hence 'b' represents the velocity. Dimensions of S = Dimensions of 𝑐𝑡 2 . Dimensions of 'c' are that of acceleration. Hence 'c' represents the acceleration. Ans: The dimensional formula of 'a', 'b' and 'c' are [𝐿1 𝑀0 𝑇 0 ], [𝐿1 𝑀0 𝑇 −1 ], and [𝐿1 𝑀0 𝑇 −2 ]. The quantities represented by a, b and c are displacement, velocity and acceleration. where P is the pressure, d is the density of a gas. What is the dimensional formula for 𝛾? temperature and a, b, R are constants. What is the dimensional formula of 𝑎 ⁄𝑏? 1. What are the S. I. units of k so that the equation? the S.I. units of 𝑘 in terms of the base units? a. Find the possible units of ′𝛼′ and ′𝛽′. b. Write down the base S.I. units of specific heat capacity. 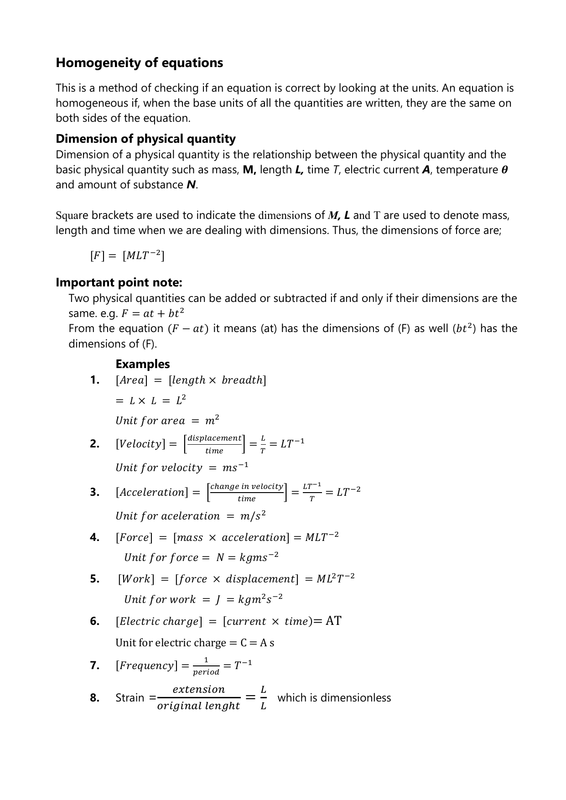 Determining a physical quantity usually depends on a number of other physical quantities. where.𝑥 and 𝑦 are non-dimensional constants. where k is a dimensionless constant of proportionality. equation must be the same as the units on the right side of the equation. speed of sound in a medium. Unit of E: 𝑘𝑔𝑚−1 𝑠 −2. where 𝑘, 𝑥, 𝑦 and 𝑧 are non-dimensional constants. a) a. radius of the tube. 𝑙 = length of tube. horizontal tube in terms of 𝑎, 𝑙, 𝑝 and 𝜂.
𝑤ℎ𝑒𝑟𝑒 𝑘, 𝑥 𝑦 𝑎𝑛𝑑 𝑧 𝑎𝑟𝑒 𝑑𝑖𝑚𝑒𝑛𝑠𝑖𝑜𝑛𝑙𝑒𝑠𝑠 𝑐𝑜𝑛𝑠𝑡𝑎𝑛𝑡𝑠.